When was the last time you were put into a situation that was unfamiliar to you? An experience that encouraged you to learn something totally different, kept you on your toes? Participate in an opportunity to meet people that were different than you? If you’ve done that recently or can think back to the last time you did then you know how students are when they learn new skills in your classroom. This weekend I had one of those chances. 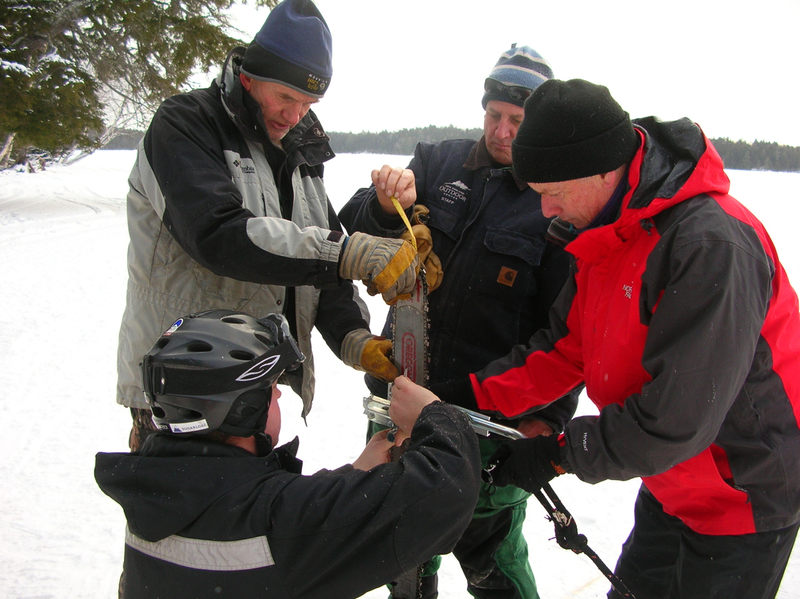 My husband and I traveled to northern Maine to help with “ice cutting” at Libby Camps. It is a place that he is very familiar with since he guides bird hunters there in October each year with his guide service Maine Outdoors. 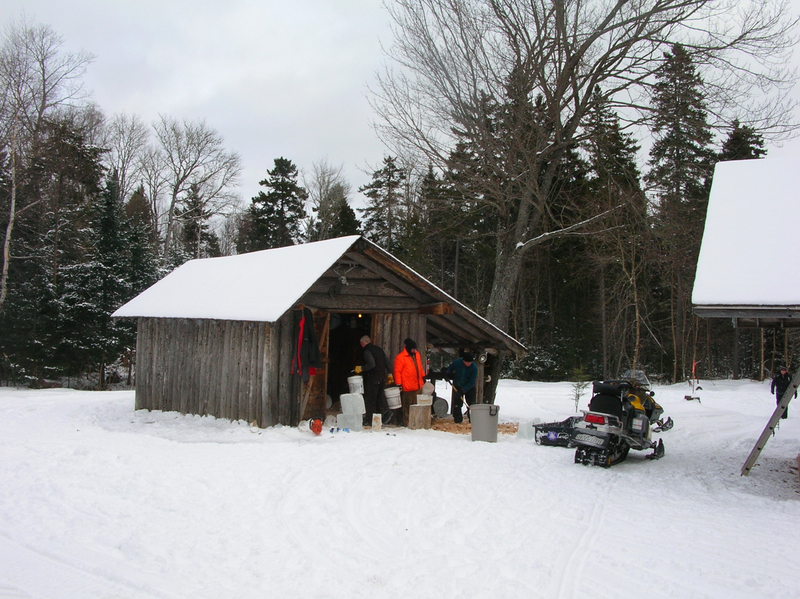 We traveled through Patten on the paper company roads as far as the road was plowed and hopped on snowmobiles for the 6 mile ride through the woods, onto Millinocket Lake and to the other side where the camps are located. All morning and afternoon folks arrived, some on skis, some on snowmobiles. During late Spring, Summer and Fall the road is good enough to drive all the way to camp but none of the nearby roads are plowed this winter let alone the two mile long driveway. 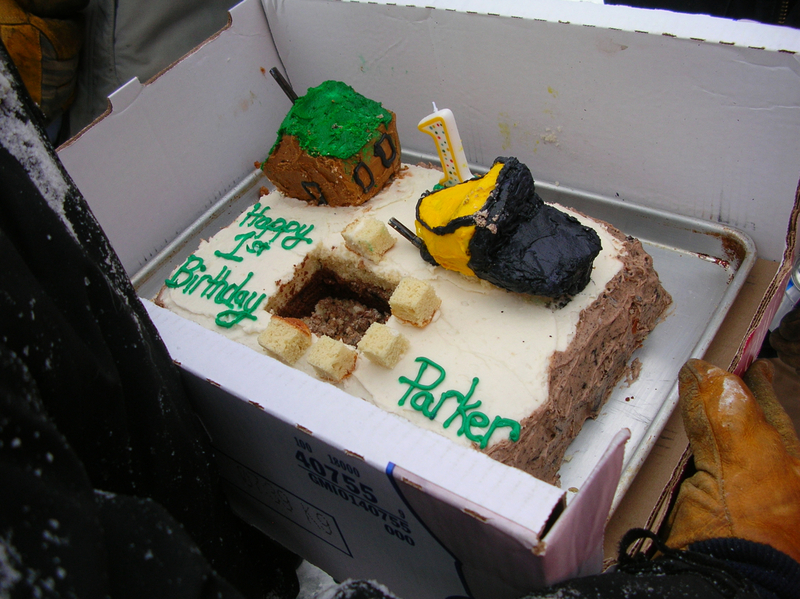 On Saturday we started the day with a hearty breakfast and 23 of us headed down to the lake where the ice cutting got underway. Two places about 20’ x 30’ on the ice were cleared of the 6” of snow. 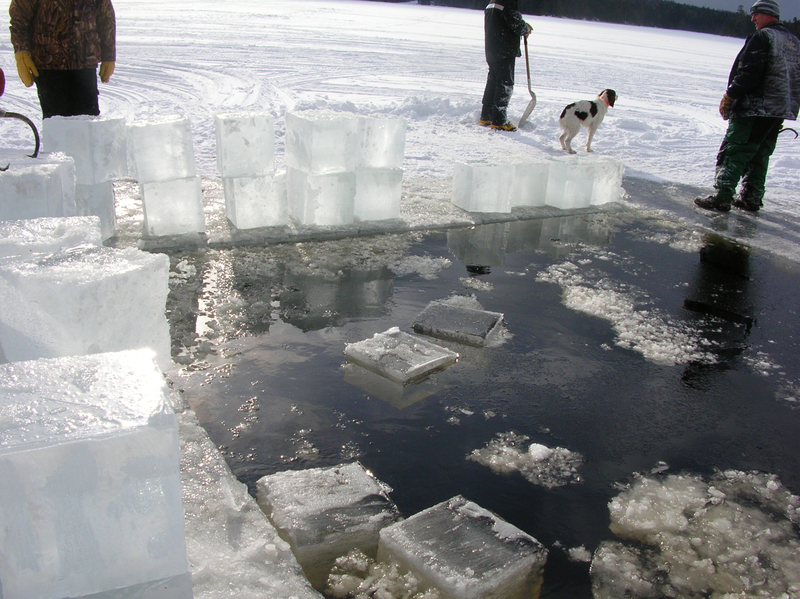 First a “sucker hole” is cut so the blocks of ice can come out easily and to measure how deep the ice is. 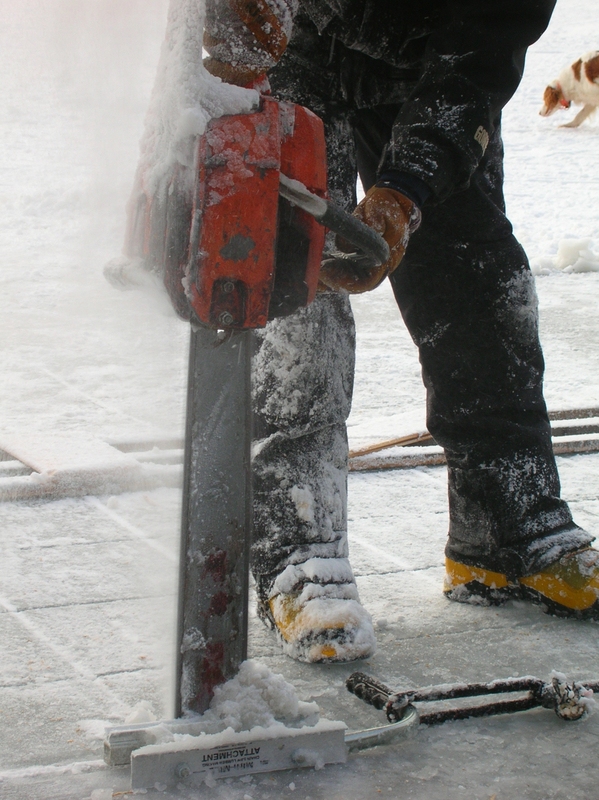 Two chain saws are used, one to score the ice and one with a 36” blade to cut through the 13” of ice. 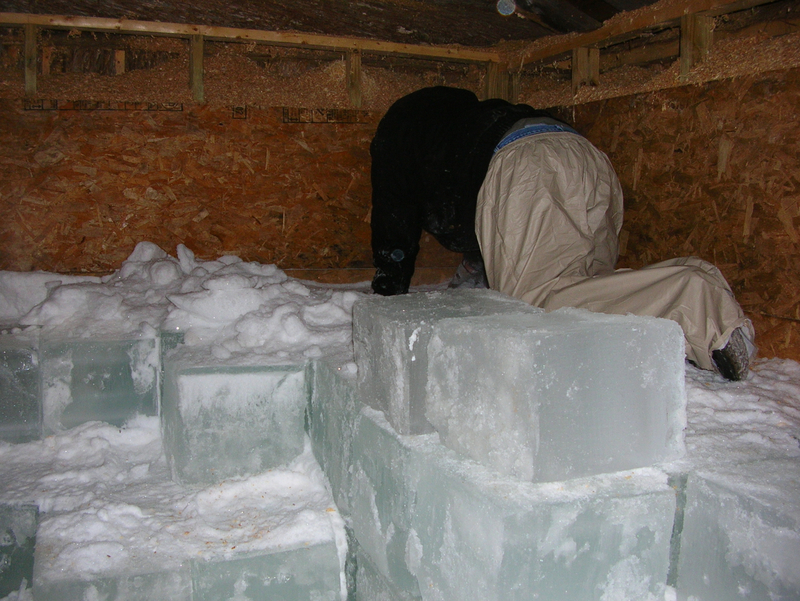 When the first block came out the folks in the know exclaimed about how perfect the ice was. Snowmobiles with empty tote sleds attached were in place. 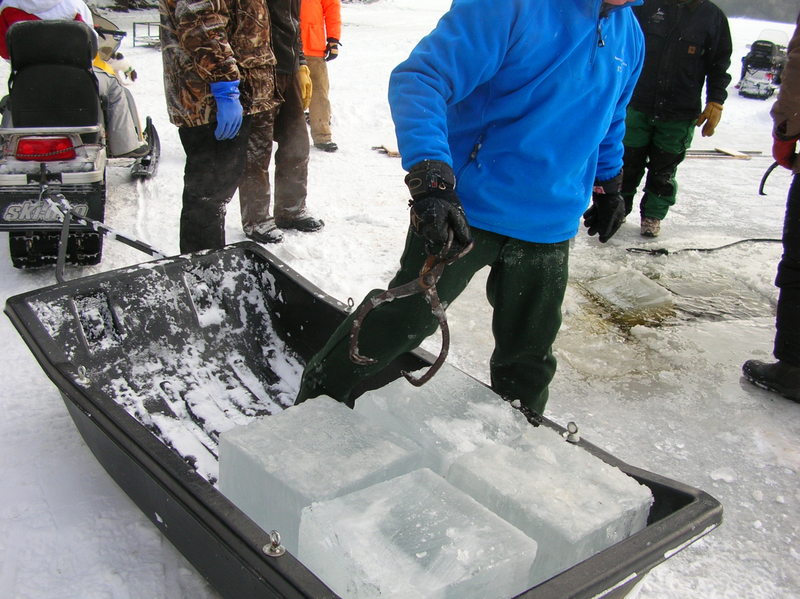 Large ice tongs were used to lift the huge blocks (maybe 60 lbs.) out of the water, into and out of the sleds. 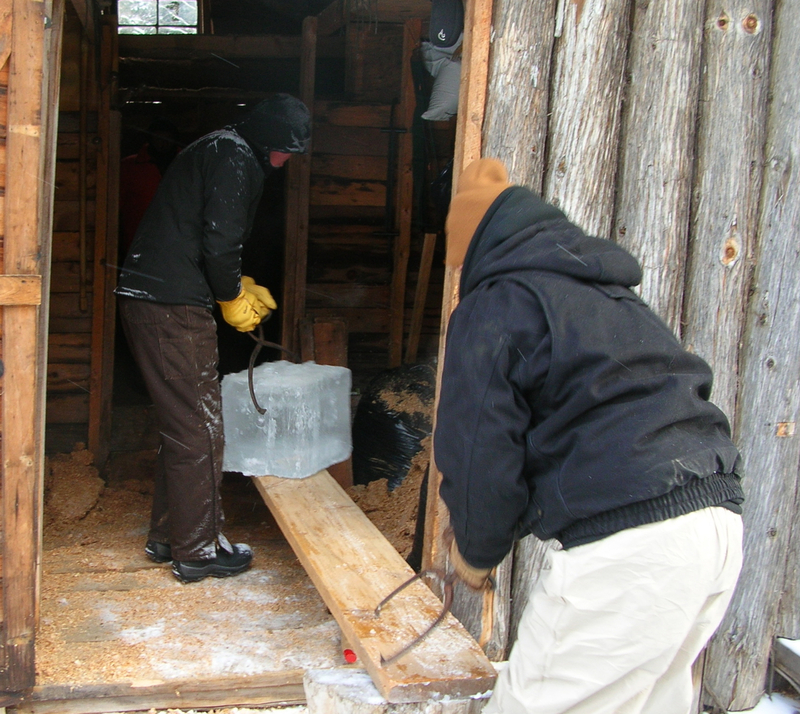 The sleds take the ice up to the icehouse where a crew unloaded and somewhat carefully stacked the blocks for next summer and fall. 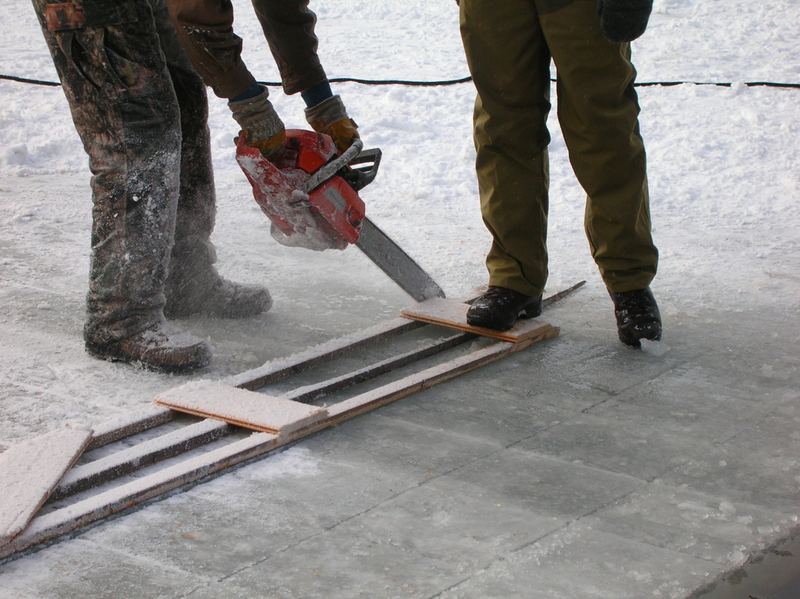 Loose snow covers the blocks so the layers don’t stick together and along the edges and on top saw dust is used to insulate the blocks. Almost 300 blocks were cut and packed away. Some of the crew had participated for several years and for others, like me, it was a first. A fun group of folks who all chipped in and did their part, some doing the same job during the three and one half hour task and others rotating jobs to experience it all. I looked forward to the trip for several months and I was not disappointed. The Libby’s, including Matt and Ellen and their son and daughter in law, Matt and Jesse, were grateful to all who participated and the record ice cutting time left an afternoon of exploring, creating and hanging out by the fire. 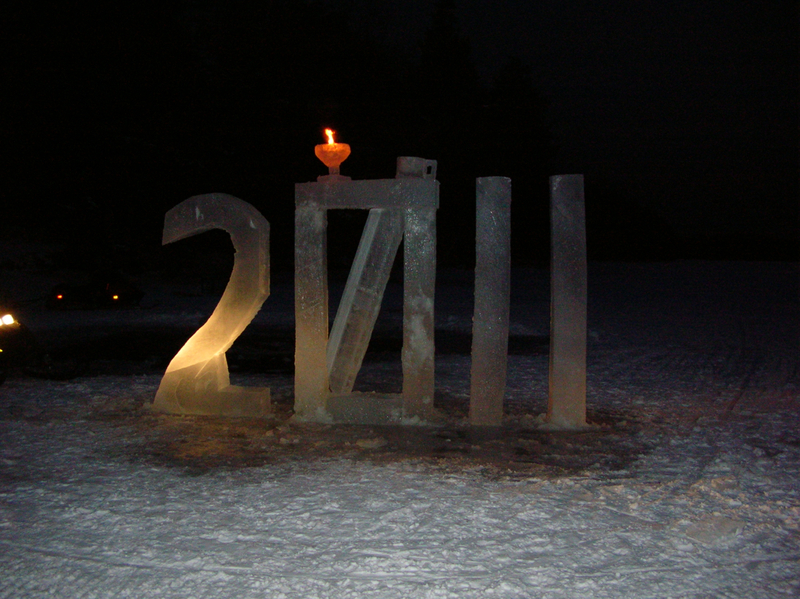 The creativity exploded with some chain saw sculpting with ice as the medium. Eight foot high numbers making 2011 were cut and stood up and a goblet placed on top. As some of the group snowmobiled across the ice at dusk the goblet looked like the Olympic torch burning up high. Needless to say it was a great way to end an interesting day! We headed to supper with smiles on our faces and to celebrate Matt and Jess’ sons one year birthday. I really enjoyed learning something new and learning something first hand I had only heard about. 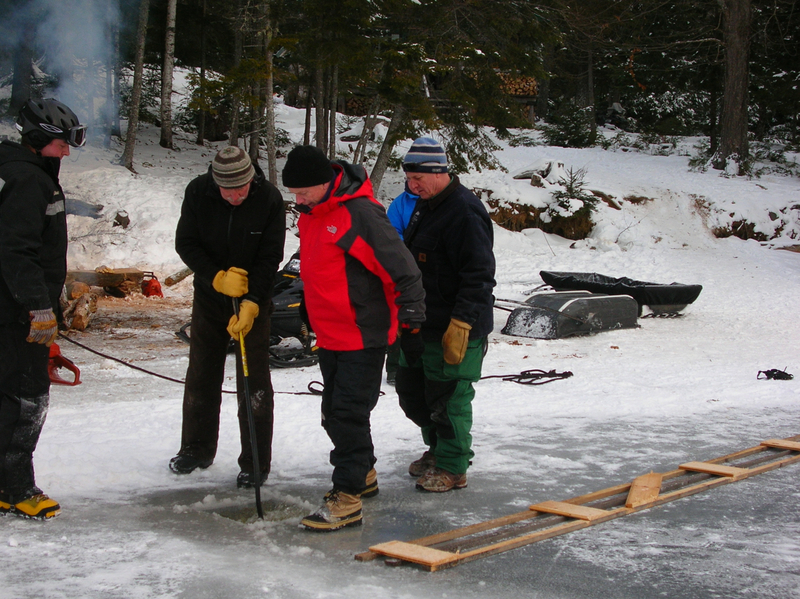 I hope you will take the opportunity to enjoy the Maine outdoors this winter! Of course, I invite you to take a few minutes to post comments below. 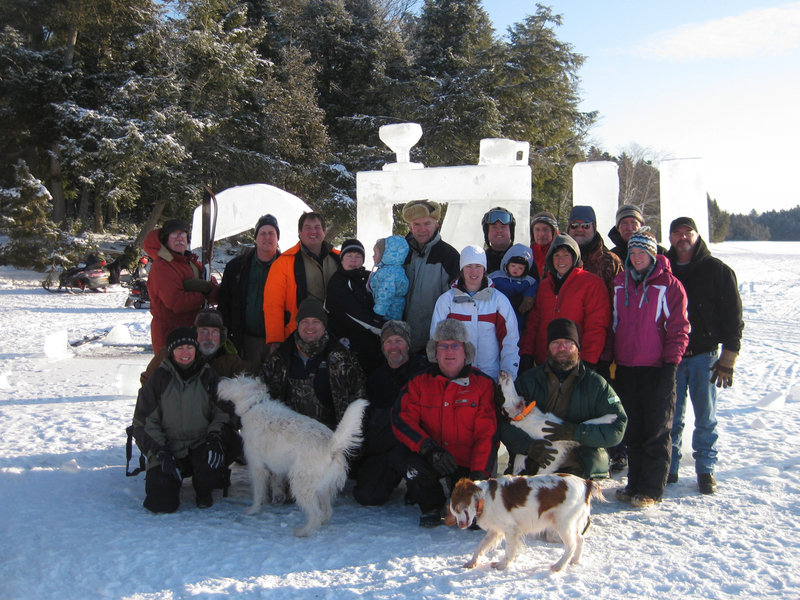 I saw the article in the Bangor Daily News today that they were ice cutting on Little Black Lake 12 miles from downtown Fort Kent where they are constructing the Chateaux Festival, an 80′ x 28′ ice structure for activities associated with the World Cup Biathlon races to begin Feb. 10th. They cut 800 blocks. Did any of you participate? This week the Maine Department of Education (MDOE), Maine Alliance for Arts Education (MAAE), and the Maine Arts Commission (MAC) sent a call inviting communities to apply to be recognized as an Imagination Intensive Community (IIC). The information is online at the MAAE site and at a new page devoted to the project at the MDOE site. As time passes there will be more information about the project including the 2010 IIC of Arundel, York, North Haven, Blue Hill, Deer Isle-Stonington and Camden-Rockport. The application for applying is online at the new page. Included is the time line of the process so don’t hesitate download your application today since it is due on March 14th. 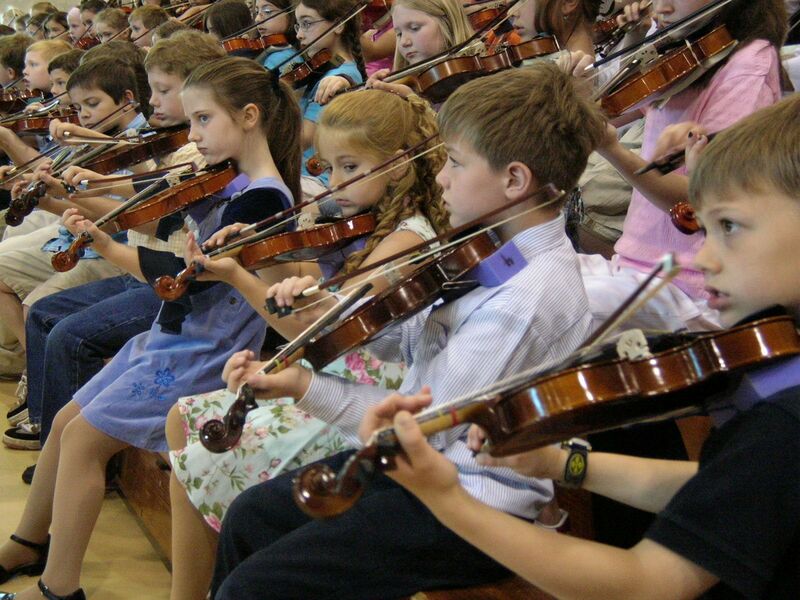 Funding for this project is from the Kennedy Center, the Maine Arts Commission, the Maine Department of Education, and Bangor Savings Bank, the Imagination Intensive Communities program is in its second year of identifying and celebrating, through an open application process, those Maine communities where schools and partnering organizations of all kinds invest in the imaginative development of children and youth. January 28 and 29th at Point Lookout in Northport. If you finish one of the following sentences and post it on Syntiro’s Facebook page wall you will be entered in a drawing for a free Winter Retreat Registration. I would love to attend the Winter Retreat because . . . . I value Syntiro because . . . . The deadline is Friday, January 21st at noon. Click here to enter! To learn more about the conference read the blog post by clicking here. You are currently browsing the me arts ed blog archives for the day Monday, January 17th, 2011.